Interior renovations at the West 76th Street townhouse are still ongoing after nearly three years. 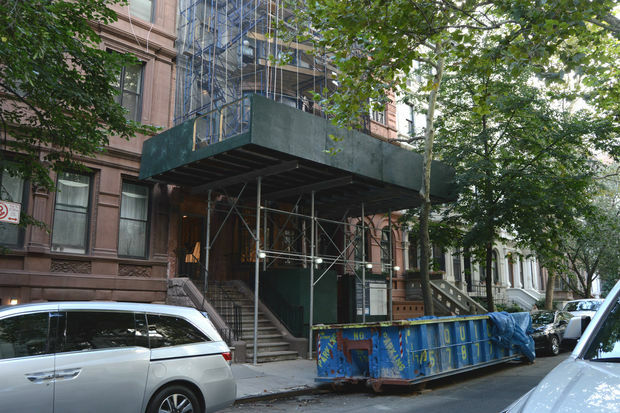 MANHATTAN — The daughter of Congresswoman Nita Lowey is driving her Upper West Side neighbors crazy with a nearly 3-year townhouse renovation. But the political progeny says it's the neighbors who keep her up at night, calling one of them a "menace" that needs to be muzzled. The 4-story townhouse at 32 W. 76th St. was purchased by Holliswood Development in mid-2014 for about $10 million, according to the company’s CEO and president Dana Lowey Luttway, who is also the daughter the suburban New York congresswoman. While the company is known for flipping properties, Luttway told DNAinfo New York that she intends to live there with her family. According to the Holliswood listing, the renovations include a wine room, a gym, and a "1,500-square-foot roof garden and outdoor entertainment area." "When I bought this house, we named it 'dream house' because it was my dream," Luttway said, adding that she expected construction to take no more than two years. Next-door neighbor Joseph Bolanos said he and others have lodged complaints throughout the renovation process that started in January 2015, citing noise and dust pollution they say have diminished the block’s quality of life. “The issue here is that [the developer] has no supervision of the contractor. The contractor is chronically bad and dangerous,” said Bolanos, who is also the president of the West 76th Street Park Block Association. “And we take an active stance in protecting our block and residents." Bolanos added that the developer was unique in that her mother is a member of the U.S. House of Representatives, and suspected some political influence in how her project was allowed to proceed. "Considering her mother is a Democratic Congressmember, I'm sure she has political connections," Bolanos said. "It would be naive to think that somehow political connections don't have a play in this." Bolanos’ efforts over the years have led to two stop-work orders, one in September 2015 for lack of excavation notification and failure to monitor vibrations, and another in March 2017 for failure to provide overhead protection, according to records from the Department of Buildings. Bolanos says that a nearby sinkhole in May 2015 also halted work for weeks. “If the construction was properly done by a code-compliant contractor, there wouldn’t be so many complaints,” Bolanos said. Throughout the project, ABR Builders LLC has paid the city $7,200 for various violations including the incidents that led to stop-work orders, but also for excessive debris in the building and for working on the third floor without a design drawing. The department added that two of these violations were paid for, but the contractors have not yet proven that the conditions were fully corrected, and currently owes the DOB $1,500 for failure to provide that proof. ABR Builders LLC did not immediately respond to requests for comment. In November of 2015 the New York Times also covered Bolanos' charge that Luttway's house sits precariously above an ancient stream, which he argues makes for a compromised structural integrity. Luttway and her engineer Ray Volpe counter that there is no stream directly underneath the property, and that they have devised a secure excavation plan. Luttway added that the sinkhole had nothing to do with her project. But it's not just Bolanos who has complaints about the renovations. “It’s not quiet, it’s not peaceful. It just changes your sense of safety and sense of feeling comfortable on the block,” Renata Funghini, who’s been living on the block for 50 years. Others like John Mainieri say they’ve often had problems with the unprofessional and rude construction workers. And Judith Rymer, who’s owned her apartment since 1984, said the project was “horrifically annoying,” and questioned its seemingly endless timeline. Luttway explained that Bolanos’ accusations have caused her at least six to eight “months of delay and huge financial distress,” and that she is aiming to complete the project in early 2018. But Luttway also hinted that the battle over the renovations may have irrevocably ruined her "dream house." Meanwhile, Bolanos said he’s planning to reach out to elected officials and city agencies requesting they evaluate the project again. More recently, he's been monitoring the dust mitigation and vibrations the heavy construction equipment is causing.